View of the house (with the awning) from the river. Afternoon Delight overlooks the tidal Crane river. 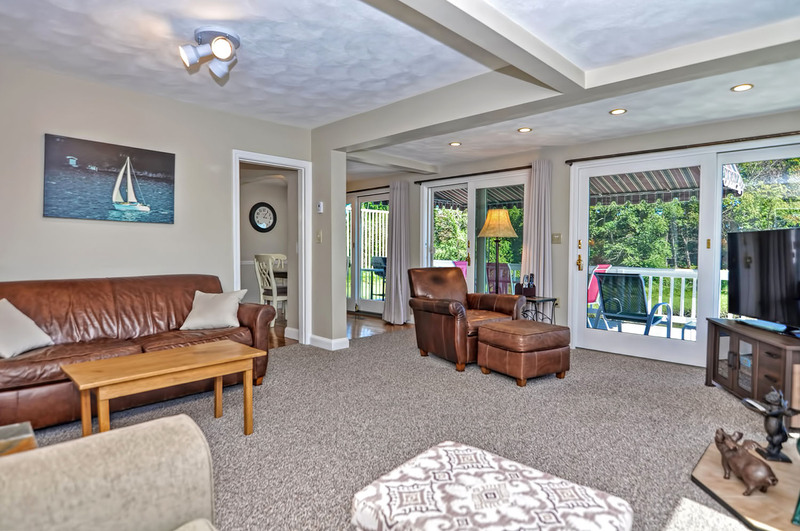 The sunny living room offers expansive river views. Living room, with a view into the kitchen. Doors to the wraparound deck are in the living room. These sliding doors lead to the deck and garden. The dining area, with seating for four. The dining area also has sliders to the deck. 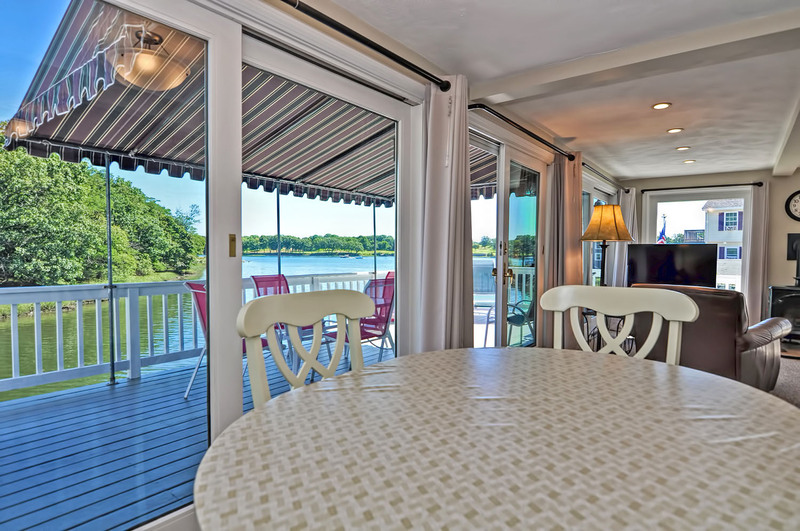 The dining area has a stunning water view. The kitchen is well-equipped. The kitchen, looking toward the dining area. Beyond the kitchen is a cozy workspace with a desk. The office nook, with a view into the ground-floor bedroom. Off the kitchen is a closet with the laundry machines inside. The ground floor bath room has a handicap-accessible shower. Another view of the ground floor bath. Bedroom 1: Master bedroom with Queen bed and TV. Bedroom 1: Master bedroom with Queen bed and TV. Front hall, with stairs to the second floor. The second floor full bath has a large soaking tub (no shower). The soaking tub. 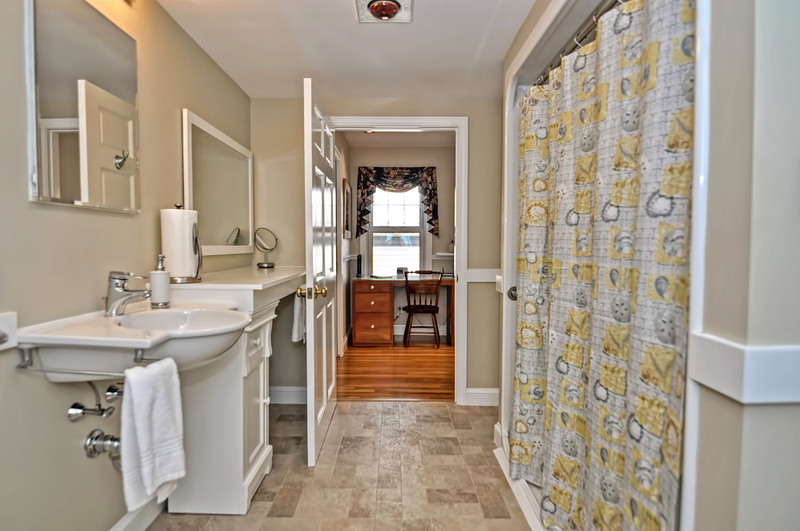 Second floor full bath. Bedroom 2: Twin bedroom with AC unit. Bedroom 2: Twin bedroom with AC unit. Bedroom 3: Queen bed, AC, and flat-screen TV. Bedroom 3: Queen bed, AC, and flat-screen TV. Bedroom 3 with Queen bed and plenty of drawers for storage. Dining table & outdoor seating on the riverfront deck. The gate on the left leads down to the garden. Front entry of Afternoon Delight. View of Afternoon Delight from the front. The house, driveway, and garage. Afternoon Delight is the 3rd house from the right. View of the neighborhood, from the riverbank opposite. View of the Crane river. Nestled in a cul de sac and fronting on the Crane River, Afternoon Delight in historic Beverly is the perfect place to watch the river currents glide by. The riverfront wraparound deck offers a blissful place to sit or dine in either sun or shade, thanks to an exterior awning. In the garden, the lower terrace is fully fenced in and has a grape arbor for relaxation in the pleasant shade. Inside, the carpeted living room has windows on 3 sides, providing an amazing view of the changing river scene. The kitchen is updated and fully equipped, and there are three bedrooms, one of which is on the ground floor and has an adjacent bath with a shower. Guests with mobility issues will also appreciate that the driveway is level with the front door, the front door is flanked by a handle for grasping (if stability is needed), and that there is just one small step to get in to the house. Central air keeps the house temperate throughout. 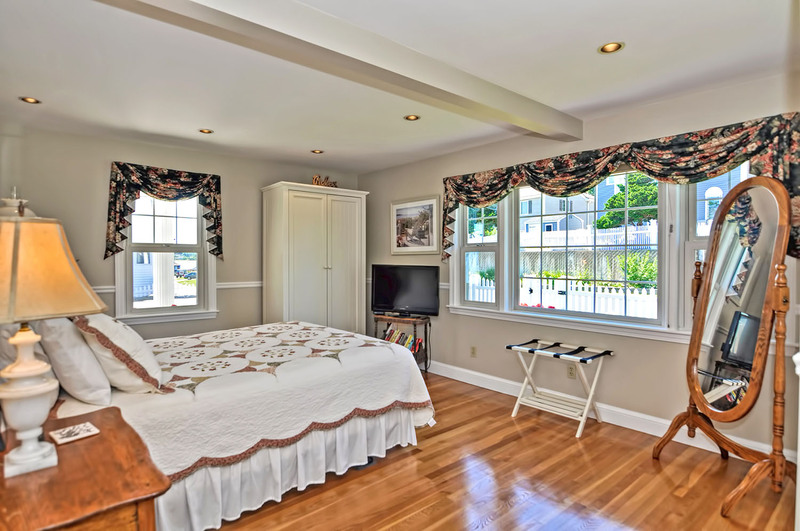 This waterfront vacation rental home provides easy access to Gloucester, Rockport, Manchester by the Sea, Ipswich, Newburyport, Salem, Marblehead and Boston. 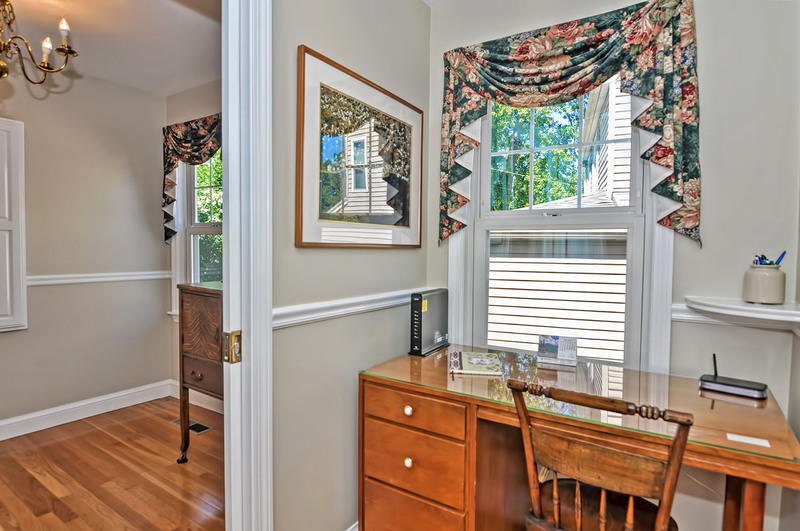 The house is also conveniently located near Salem State University, Landmark School, Bishop Fenwick High School, Gordon College, and Endicott College, offering students, their families, or anyone at all a comfortable and lovely home base convenient to endless local delights. 1499 Sq. Ft. No pets. No smoking. Living Room: A sunny room with windows on 3 sides, the living room contains 2 sofas, an armchair with ottoman, a flat-screen smart TV equipped with Netflix, and a gas fireplace. Kitchen: The kitchen has abundant counter and food prep space, as well as new lighting and chairs (as of 2016). To the left of the kitchen is a small home office or study space. 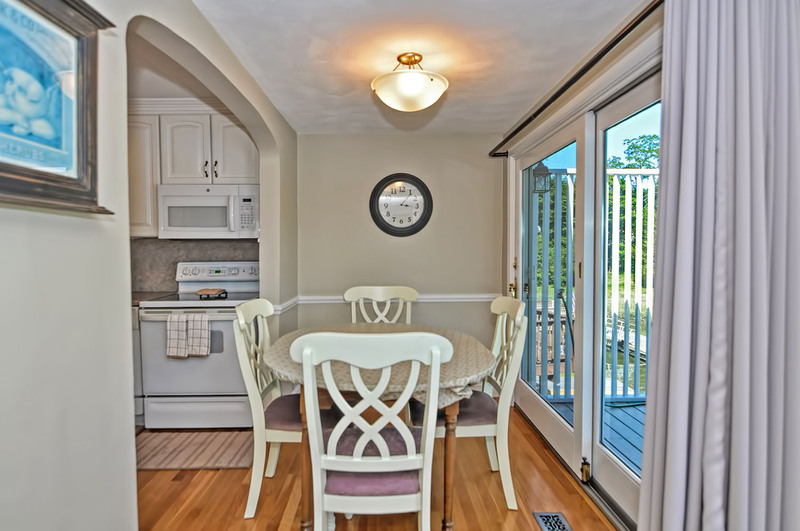 Dining Area: Dining area is off of the kitchen and has a water view. Bedroom 1: Master bedroom with Queen bed, a TV, and hardwood floors. Full Bathroom 1: Large bathroom with shower seat. Bedroom 2: Queen bedroom has a river view, a TV, and A/C. Bedroom 3: This bedroom contains two Twin beds and A/C. Full Bathroom 2: This bathroom features a large soaking tub (no shower). 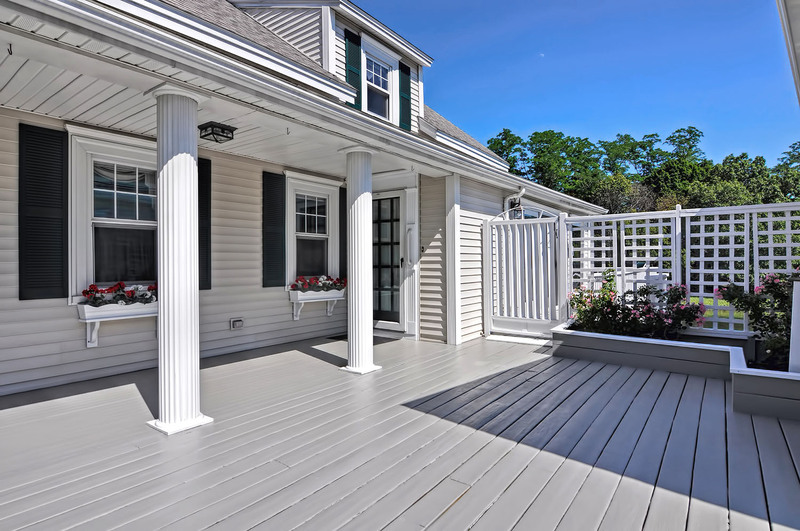 The deck overlooks the spacious yard and features a patio dining set with a half deck awning for shade. There is also a gas grill and additional outdoor seating. The driveway can accommodate up to 4 cars. On-street parking is also available. Came to the area for vacation near family. Relatively very good. The home is in a scenic location and working class neighborhood. The house is very clean and well equipped. The house is older and has been refurbished. The floors in the front rooms have an obvious slope from front to back. The light switches, although labeled, are many and not in intuitive locations relative to the light fixtures. The AC in the back of the house is not adjustable. The AC for the front of the house could only be set to approximately 72 degrees. The house gets all-day summer sun and heats up the house. To help control the heat in the house the drapes must be kept closed eliminating the scenic view completely. There is a side entry gate to the deck. The locking mechanism is at the top of the gate while there is a 1" raised floor. This is a tripping hazard if one does not pay attention. Thank you for your review. We are happy to let you know that Afternoon Delight now has A/Cs in the upstairs bedrooms and Presitge heat and sun glare reduction film on the groundfloor windows, We appreciate your feedback on the 1" deck differential and have found a safety solution. Great time was had by all. Had family in neighboring town and couldn't all fit in the house so this house met all our needs. Had a great time hanging out on the deck and having everyone over for dinner. House fit all our needs and more. Enjoyed watching the boats and birds. Great location on the water that invites you to relax. Layout of rooms, kitchen, living room are thoughtful and everything is kept in immaculate condition. This is a beautiful home located in a peaceful neighborhood. The home was very clean and had the all the amenities that we required. We were very happy with the home, with one exception, we had an issue with the ac unit. This home has one ac unit, and we were told that if the ac unit went below 72 degrees, it would freeze. The downstairs was comfortable, however, the upstairs bedrooms were very uncomfortable, especially to sleep in. The owner and property management were kind enough to lend us floor fans to help with the air circulation. This helped a little, but did not solve the problem. 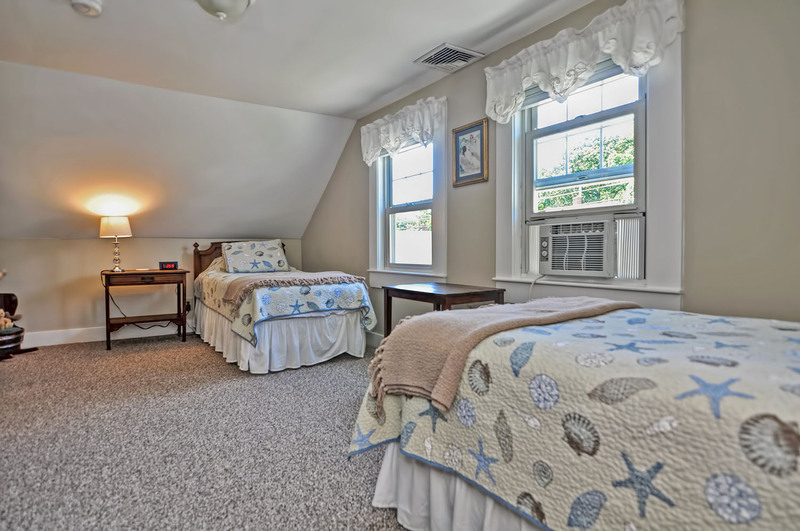 The owners should seriously consider purchasing and installing window ac units in the upstairs bedrooms, so the guests can be comfortable and get a good nights sleep. Thank you for your review. We are happy to let you know that Afternoon Delight now has A/Cs in the upstairs bedrooms! My husband, children and my parents stayed at this house rental for 9 days and I can't say enough good things about it! The kids LOVED it, loved the river and house itself. My husband and I fell in love with the views and the town of Beverly. The location was peaceful and quiet, yet things to do were close by. The house was super clean and had great furniture throughout, which is hard to find in vacation rentals. The property management team was exceptional and professional. The mobile phone app for the property was great to have and very, very helpful. All in all, great, great house/location/management, which complemented our fantastic visit to Boston. We can't wait to come back! We're glad you and your family had such a wonderful time in Cape Ann and Boston! The town of Beverly really is a wonderful place for both children and adults, so it looks like you chose a perfect location! We thank you for the compliments about our performance, and we're thrilled that we could help you make the most of your vacation - We hope to see you next summer!! A convenient location for sight-seeing in the Boston and northern sea-side towns of MA. Relaxing on the deck in the morning and evening was a real joy and the property was very clean and well maintained. The only negative experience was the air conditioning which is set at 71 deg. and can not be lowered. This made for some uncomfortable nights on hot muggy days. Our time at Afternoon Delight was exactly as the name describes. The accommodations fit our need and the views outstanding. Being flatlanders just minutes from the Rocky Mountains, seeing the tide changes was amazing and a new experience. We would recommend Afternoon Delight to anyone seeking accommodations in the greater Boston Area. I would like to say that it was awful, in order to discourage others from renting it so much, BUT IT WAS FABULOUS! My family loved it and it was the perfect location to where we needed to be. My family and I spent a week at the house and we loved every minute. The house feels like a home away from home. It's easy to find everything you need to cook and clean. The couches are comfy and the deck is that extra touch that makes it all worth it. The bathrooms were clean and in good condition. I would highly recommend this to anyone who wants a place to retreat to and enjoy the views. Thank you for your wonderful feedback! We are so glad that you enjoyed your stay and felt at home in Afternoon Delight. I have been renting vacation homes for seven years and this one was by far the best experience ever. From the home itself to the rental agents everything was first class and I would rent it again and deal with the people at AVH who were very helpful and professional. It was serene,scenic and supplied with everything one needs. 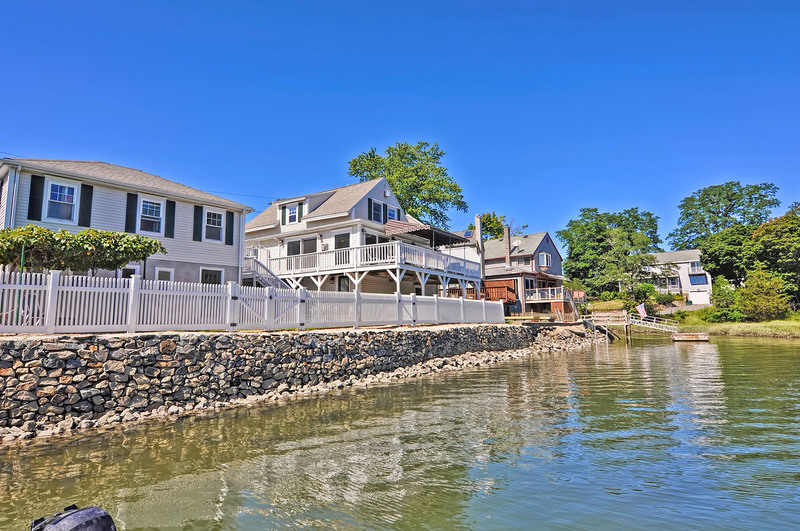 Booked this house for 2 couples to Whale watch in Gloucester and visit Salem. I'll start with the only downside: in hot weather the thermostat cannot be set below 71 degrees, and make sure you understand the effect of the tides on the waterways (mud during low tide). Great location with easy access to both Gloucester and Salem. Breakfast place within walking distance that has fantastic food. Try Candlepin bowling right in Beverly- its a hoot. Try the Ryan and Wood Distillery tour in Gloucester (in an office park). The Causeway restaurant in Gloucester is a local favorite with incredible seafood. Cape May Brewing has a really good IPA selection. Captain Bill's Whale watch was great on a little smaller boat that was better than the larger ones. Morning Glory in Gloucester for breakfast was terrific and a walk along the Fisherman's Memorial across the street to work off the meal was delightful and some interesting history. We had a fantastic time and came back each night to a super clean house where we could relax in the Living Room, Dining area, and kitchen with our own food and snacks. Highly recommended and would definitely book again. I wish my home was as nice! A lovely little house overlooking a tidal cove. Super clean and nice. Very convenient to Salem and the Peabody Essex Museum. For us it was a great vacation house. Location is not Rockport but this is a gem with more conveniences. I give it 6 stars out of 5 overall but it is not your total 'getaway' beach house and it is not meant to be that, just in case you are looking for that. It is a wonderful, fantastic property and I cannot say enough about it. I look forward to going back in the future. We rented Afternoon Delight the last week in August. The house is beautiful! Well equipped, clean, comfortable and a wonderful view from the back deck. The location was terrific - just 30 minuted from everyplace we wanted to go (beaches, Boston, shopping). We had a terrific week and look forward to renting this place again! 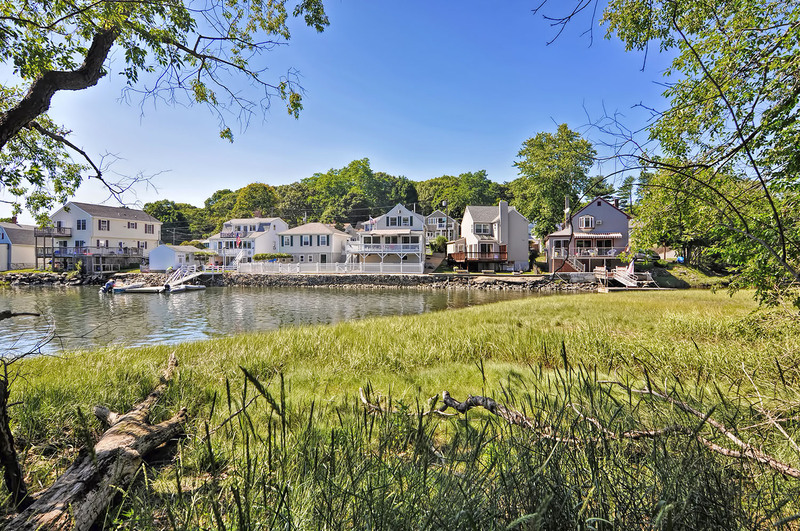 Afternoon Delight in Beverly, MA is a great vacation home if you are looking in the Beverly, MA area. It has everything a couple or family needs from a vacation home if Beverly is the desired location. We are so glad that you enjoyed Afternoon Delight, and your surroundings in Beverly. We hope that you come back soon! It has been an amazing holiday for us. The location was really convenient. The house was really homey, clean and beautiful. It was a house that could answer to all needs. The view enchanted us. Since it was located in one of the best and most central places in Mass it shortened our trip times. We reccomend this property to everyone.